Buying an enclosed trailer may seem like a very simple thing to accomplish, but it can be a bit more complex than people might initially imagine. There are a number of variables to consider, and they will largely depend on what you need and what kind of use your trailer will see. For helpful information on how to buy an enclosed cargo trailer, you can continue reading below. Is your trailer going to see light or heavy loads? Aluminum trailers are easily able to handle lighter loads, and they will save you a little bit of weight. However, steel trailers are typically able to handle heavier loads, and a properly coated and undercoated steel trailer can last for years. When considering what your trailer can handle, you should also think about the floor cross member support center. Although 24″ on center is standard, an aluminum trailer should really have at least 16″ in order to support weight adequately. Aluminum simply requires the added support. Some trailers use 12″, especially to handle heavier and more demanding loads. If you’re going to be making heavier hauls regularly, you should look into trailers with double thickness floors or diamond steel floors. It will cost extra, but it will be worth the investment. Many people think that aluminum trailers automatically last longer than steel, but steel trailers can potentially last just as long as their aluminum counterparts. Additionally, steel trailers tend to be cheaper. On the other hand, aluminum trailers do require upkeep, but arguably less than steel varieties. Proper maintenance and care will significantly increase the longevity of your trailer, regardless of the material and specific features. Most horse owners need a trailer to bring their horses to nearby trails, even if they aren’t planning on cross-country expeditions. Because the safety of your horse depends on choosing the right trailer, it’s important to make this decision carefully. Here are some things to consider when you’re looking at a horse trailer for sale. Horse trailers are usually made from either steel or aluminum. Steel is stronger, less expensive, and easier to repair, making it the most popular choice. Aluminum, however, is far lighter and much less likely to rust, making it ideal for some horse owners. Straight load trailers let you load 2 horses side by side with their heads facing the front of the trailer. Some come with side doors that let you lead the horse out that way; otherwise you’ll have to back him down the ramp. Slant load trailers keep the horses set at an angle. They usually have extra room where you can turn a horse around and lead him out head-first. In addition, you can often fit three horses in a single trailer. However, they don’t have enough space for larger horses and you can’t get to the front horse without unloading the other horses first. The size of your trailer will depend on the size of your horse and the number of horses you plan on hauling. Most trailers hold two horses, but 1- to 3-horse trailers are also available. Keep in mind that the bigger the trailer, the larger and stronger the vehicle you’ll need to pull it. 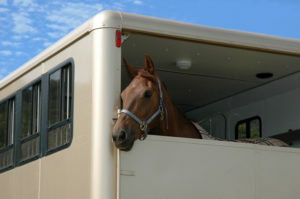 One-horse trailers can often be pulled by passenger cars and other relatively small vehicles. Your horse trailer should be comfortable for your horse to ride in: it should be padded, well-ventilated, and have dividers between animals. 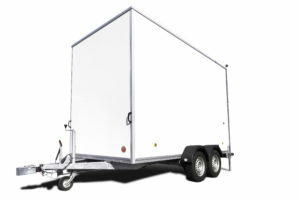 You can find trailers with a wide variety of other amenities depending on your needs and budget. For example, some allow you to monitor your horses by video from your cab. Or, if you plan on extensive traveling, you can buy a trailer with a slide-out area where you can sleep. Buying the right horse trailer isn’t always as simple as it might look. There are many variables to consider, especially if you want your horses to arrive in peak condition. For helpful tips on how to buy the right horse trailer, you can continue reading below. The two most important considerations are comfort and space. The more comfortable your horses are, the less likely they are to get injured. That means they’re more likely to arrive in optimal health. Space is a major concern, since horses that are overcrowded can injure both themselves and others. That’s especially important if you’re looking to haul other animals alongside the horses, or you’re wanting to transport equipment in the trailer as well. Traditional horse trailers have the horses facing forward and may or may not have a divider. A divider is useful, since it helps to keep the horses from bumping into each other. Usually, these trailers don’t have ample room, but should be more than sufficient for transporting a couple horses. The major benefits are that traditional horse trailers tend to be cheap and easy to find. Slant load trailers tend to offer ample room and comfort. They require greater length for fewer horses, but the major advantage is that your horses will be more prone to arrive in excellent health. Equestrian enthusiasts may be the happiest with a slant load trailer, since the horses will have more room to move around without possibly injuring one another. Stock trailers can be used for horses, but they’re also often used for cattle or other animals instead. That does offer the benefit of being a multipurpose trailer, which is certainly attractive. However, a stock trailer divides the horses into two separate sections without dividing them individually. That means they’ll often have enough room to find a favorite spot, but they won’t be prevented from injuring one another. When you’re looking at a horse trailer for sale, it’s a good idea to keep in mind your needs and the demands of the horses themselves. What’s cheap and easy might not always be your best investment in the long run. Hauling goods and equipment can be costly if you are renting a trailer every time. If you are frequently renting trailers for any purpose, consider the cost and convenience benefits of owning your own enclosed cargo trailer. In addition to cost and convenience, here are some of the other benefits of owning an enclosed cargo trailer. Even if the weather starts out sunny when you’re hauling things somewhere, a lot can change during your journey. The weather can shift quickly and choosing an enclosed trailer could ensure your things are transported safely, even if the weather doesn’t cooperate. The items you’re moving might be expensive to replace. They might even be sentimental items that are ultimately irreplaceable. 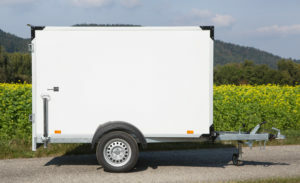 An enclosed trailer seals and protects the contents from weather, but it also prevents other people from seeing what’s being hauled, keeping your valuables safe from theft, damage, or vandalism. Whatever size trailer you choose, buying an enclosed trailer will increase your hauling capacity. When you carry things in a truck, stacking items into the back of your truck or van will impede your ability to see out your rear window and leave no room for passengers. Purchasing a cargo trailer means that you can travel with passengers in your vehicle and fill up your trailer as full as you can. Owning an enclosed cargo trailer is more affordable than you might think. In addition to saving on fuel costs, renting a smaller trailer might be even more expensive than purchasing a large cargo trailer of your own. You don’t have to be a long-haul truck driver or moving a lot of equipment on the daily to make owning an enclosed trailer make sense for you. In addition to a lower cost and more convenience, consider the above 3 benefits of buying your own enclosed trailer from enclosed trailer manufacturers. Whether you’re delivering merchandise, transporting livestock, or shipping vehicles, it’s virtually inevitable that you’ll need assistance with hauling some form of cargo. Everyone in business knows how important deliveries are and that personal demands are no less important. Depending on the cargo, you may have specific needs that simply won’t be met by any standard flatbed. For helpful information on the different types of cargo trailers available, you can continue reading below. It’s always a good idea to have the right tool for the job. An enclosed cargo trailer is a great, all-purpose means for handling a variety of items. These are easily hitched to a truck or car for travel, and cargo trailers come in many different sizes to meet your needs. With proper handling and packaging, these trailers can easily handle hundreds or thousands of miles of travel. They’re easy enough to maneuver that even less experienced drivers can manage them with minimal difficulty. If you need something relatively basic, but functional, durable, and reliable, a standard, enclosed cargo trailer is an excellent option. The transportation of livestock will obviously bring about specific requirements. Room is a concern, since there will be a minimum amount of area needed for each animal, and each will have different demands. Horses are common, but livestock trailers are also used for goats, pigs, and cattle. A gooseneck livestock trailer offers increased stability and greater hauling capacity, which is why they’re incredibly popular for livestock. They come in many different widths, lengths, and heights, so there’s bound to be one that can suit your needs. For outdoor lovers and extreme sports enthusiasts, a snowmobile is considered to be essential. However, there are many cargo trailers that aren’t well suited to transporting snowmobiles. Luckily, there are custom-designed trailers that are specifically built to haul snowmobiles. If you consider your snowmobile to be a seasonal necessity, it’s a good idea to invest on a snowmobile trailer. Of course, there are many different cargo trailer dealers available. When looking for the best options available, it’s a good idea to keep both your needs and your local dealer’s reputation in mind. Not all dealerships are made equally, so always look for customer satisfaction and guarantees. It’s important that you’re satisfied with both the shopping experience and the product. When purchasing a horse trailer, it’s important that you consider the horse’s point of view. After all, they’re going to be the primary occupant of the trailer, and you want to ensure that your horse is both safe and comfortable in the trailer that you purchase. For a few tips on buying a trailer that is right for your horse, keep reading. If you’re a 7-foot-tall, broad-shouldered man, are you going to want to purchase a subcompact car? Probably not. It’s simply not the right fit for your build. Similarly, you need to consider your horse’s size when purchasing a trailer. An average-sized horse (between 15 and 16.5 hands) needs about 10 feet of length to be comfortable. If your horse is much bigger than this, you’re going to want to look at longer trailers. Horses need to spread their legs out during transport in order to be stable, and they have to be able to use their head and neck easily to help keep their balance. Ensure that any trailer you purchase has enough room for your horse to do this. When your horses are in a trailer, dust, exhaust fumes, urine, and manure are often swirling in the air around them. If these fumes are not properly ventilated, they can become ill. Ensure that the trailer has plenty of ventilation, including lots of windows or slats, as well as roof vents. More than anything, you want your trailer to keep your horse safe during transportation, so ensure that there are no hazards in the trailer. All hitching rings and latches should fold flat against the wall so your horse can’t cut himself on them. You also want to ensure that posts and dividers are strong and sturdy, and won’t be knocked down by a horse that gets spooked in transport. 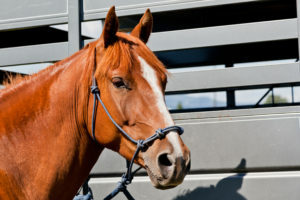 While most horses aren’t big fans of trailers, you can make the experience much better by taking their perspective into consideration when looking at enclosed horse trailers for sale. Material – Most enclosed trailers for sale will be made of aluminum or steel. Aluminum remains in good condition longer, resisting rust and corrosion. Aluminum is also lighter. Steel, however, is hardier. Just be sure you get a trailer made with a 100% aluminum body, not just sheet coating. Openness – Some openness and ventilation is a must for your livestock. They need light, air flow, and feed doors in order to be healthy and calm during transport. However, they still need some sense of enclosure in order to be safe from the elements and road debris. Mats – Most trailers come with a rubber floor mat, a material that offers cushioning, durability, and noise reduction. For the most part, a 3/4-inch mat will provide support and comfort without making livestock feel unstable. There should also be matted walls to prevent impact injury while you drive. Dividers – Dividers act as safety belts for your livestock without being too restrictive. Ensure that the dividers are stable, won’t swing, and offer appropriate spacing for your livestock. Supported and corrugated aluminum is the ideal material for dividers. Dealer – A good dealer should be flexible in helping you find exactly what you need, as well as offer you the ability to customize your order. They should also have great prices and financing options, rather than expecting full payment up-front. Good livestock trailer dealers will be willing to work with you so you get what you need for a great price that helps you stay in business. Are you an individual who has a personal interest or career that involves outdoor activities, heavy equipment, or driving small vehicles? You might consider buying an enclosed trailer. Enclosed trailers can do more than just carry horses and other types of livestock. They can provide additional space that might not exist in your own home or garage. Regardless if you do travel a lot or not, there are a few uses that make finding an enclosed trailer for sale a good idea. Motorcycle riders understand how important it is to keep their rides in top condition. It is not uncommon for you to find that storing your motorcycle safely can be rather tricky, especially if you lack space in your own garage. Enclosed trailers provide more than enough space to store your motorcycle. This makes them the perfect places to store additional tools and equipment that are used to maintain your ride. They are also a great way to transport classic motorcycles to shows without being damaged. Enclosed trailers can also be great additions for your career and personal hobbies. Sometimes you might need to deliver something heavy to the office or workplace. You might use specialized or dangerous equipment and need a safe place to store it and any additional tools that are not being used. 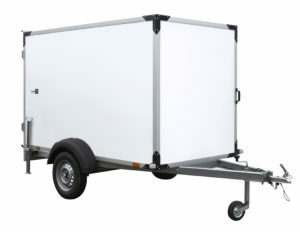 If you do vocational work, these trailers make great places for you to do your crafts. If you are part of a band, enclosed trailers are a great place to store musical instruments and do practice routines with minimal neighborhood disturbance. Similar to motorcycles, you can also use your enclosed trailers to store most single passenger all-terrain vehicles. It is not uncommon for most individuals who own an ATV to have to travel long distances in order to find a place to use them. An enclosed trailer lets you take your ATV anywhere you want so you can enjoy them with your family. You can also store ATVs inside trailers to keep them protected and in good condition. Tools used for maintenance and upkeep can be kept inside as well. Enclosed trailers are also very useful for individuals who enjoy spending most of their time in areas where snowfall is common. This is especially true if you own a snowmobile. An enclosed trailer is also useful for those who enjoy using their snowplows during seasons outside of winter. Since enclosed trailers are larger than most snowmobiles, you can store your wet clothes to dry inside as well. The same can be said with any equipment that is used for snowmobile maintenance. An enclosed trailer is a great way to transport bulky cargo from place to place. Whether you transport items for fun or for business, an enclosed trailer can protect your cargo from the hazards of driving on the road as you move from point A to point B. Enclosed trailers come in a wide variety of shapes and sizes so you should have no trouble finding one that is perfectly suited to your needs. As you begin to look at various enclosed trailers that are for sale, here are a few things to consider before contacting the dealership. Size – There are two factors that should determine the size trailer you need. The first is the physical dimensions of what you are hauling. Second, you need to know the weight. If your cargo is particularly heavy, you may need a larger trailer to accommodate the weight. Towing capacity – Another important factor to know is the towing capacity of your tow vehicle. An SUV typically has a very different towing capacity when compared to a truck. Knowing this capacity will help you avoid a dangerous situation. Axles – Twin-axle trailers typically haul significantly more weight than their single-axle cousins. Twin axles also tend to tow better with less sway than single axle trailers. The extra set of tires also gives you additional protection in the event that one of the tires fails while you are driving down the road. Finances – The final thing you should be aware of is how much trailer you can afford. Financing is generally available for new trailers but you should know how much of a payment you can handle and how much cash you have to put down before you go to the dealer to pick out your trailer. A good enclosed trailer can protect your cargo from many of the hazards that it would encounter while traveling on the road. An enclosed trailer dealer can help you choose the cargo trailer that best suits your needs. A horse trailer is a large, expensive purchase, and you’ll want to make sure you get it right the first time. If you want to make sure your horse will be able to ride in it safely and comfortably, you need to plan ahead and know what you’re looking for before you buy. We have a few tips to consider when looking for the best ride for your horse. What size trailer you get will depend heavily on your horse’s height, weight, and even breed, as some breeds’ temperaments mean that they require more or less space. 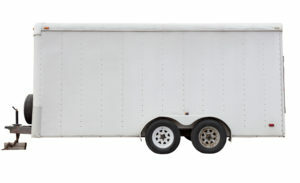 Generally, though, a standard trailer size on the inside is about 10 feet long, 6 feet wide, and 7 feet high. This fits horses about 14-16.3 hands, and riders with horses of other sizes should plan accordingly. Remember that even if your horse does not fit in a standard trailer, many manufacturers can create custom trailers. Instead of just buying the first horse trailer for sale that you see, you should keep in mind that not all trailers are made in the same way. For instance, you might run across a manger-style trailer that leaves a person trapped at the end and realize that’s not for you. If you are new to these trailers, you might be better off looking for a walk-through style with a side door for you. The loading style can also vary trailer to trailer. Trailers come in straight load, which gives good balance for long rides, or slant load, which allows your horse to see his surroundings and makes him feel less confined. Different trailers also have different types of ventilation. You should look for a trailer with roof vents over each horse head and sliding windows to regulate the temperature. Also, if you have an aluminum roof, make sure it’s insulated to prevent it from heating up, or find a roof made of fiber composite or other materials. Many horse trailer dealers sell both used and new models. Like with any vehicle, used models are often cheaper, but you may rightly worry about the condition of the trailer. If you go this route, be sure to check the reputation of the company and give the trailer a thorough inspection. There are hundreds of safety regulations that trailer manufacturers are required to comply with before their product leaves the plant. From the basics like proper lighting and reflective tape placement to ensuring safe and accurate hauling capacities, each and every cargo trailer must meet Federal Motor Vehicle Safety Standards (FMVSS). Steel trailers are heavier, while aluminum trailers are significantly lighter. Although aluminum trailers are more expensive initially, they generally have a higher resale value. The more metal in the frame, the stronger the trailer is. Brand reputation is essential. Choose a manufacturer that is established and will be around to meet warranty issues. Customer satisfaction is important. Look for warranties that cover not only the trailer frame, but key components as well. Under federal statutes, trailers are classified as motor vehicles. The trailer manufacturing industry is constantly dealing with legislation that specifically targets cars and trucks, and it is not uncommon for laws to be drafted that are not pertinent to the safe operation and manufacturing of cargo trailers. Industry experts work with legislators to create fair and pertinent safety guidelines and laws specifically for trailer manufacturers. The National Association of Trailer Manufacturers is an organization that works with cargo and enclosed trailer dealers around the world through compliance and manufacturing process guidelines, and has a global membership of 750. All members are required to take part in the NATM’s Compliance Verification Program. Every two years, NATM compliance consultants visit manufacturers to ensure their manufacturing processes follow FMVSS guidelines. To ensure your trailer meets federal compliance standards, look for the NATM decal. DoubleTake Trailers offers an extensive inventory from NATM enclosed trailer manufacturers, so you can be assured of a high-quality hauling experience. Whether you need a 6 X 10 enclosed trailer or a 7 X12 concession trailer, we offer a variety of models from quality manufacturers, and we can help you find the trailer that fits your needs. For more information, call and speak with one of our experienced trailer consultants. For us to safely use our new horse trailer, proper maintenance involving inspection the areas of a trailer for cleanliness or damage is required. By doing this, it will extend the trailer’s lifecycle by many years. When carrying out maintenance on our new horse trailer, we should also make sure to inspect and maintain all of the vital areas. Proper storage techniques, allows us to discover problem areas and act quickly when a part needs replacement. To do this effectively, we should start by checking the wheels for signs of damage. Check the tires and look for punctures, bulges, cracks, or other signs of damage or wear. We should check tire tread as we inspect the rest of the tire and we should make sure that the air pressure is enough. Also, it is necessary to check the suspension and wiring when under the trailer. We should look for any frayed, broken, or cracked components. While checking the suspension, we should remember to tuck all wiring out of the way. This can prevent it from becoming snagged when driving. Replace components as necessary. Another thing is the storage. Storing the trailer properly, specifically during the winter, tremendously increases its operational life cycle. Make sure to store the horse trailer in an enclosed area, or even elevated on plywood, to limit the damage moisture can cause. Plywood keeps the undercarriage safe from rust triggered by ground moisture. Before storing, take away items like horse tack, blankets and anything else not necessary to keep in the trailer. Then thoroughly clean the trailer using hot water. If using a cleaner, make sure it does not harm the trailer materials. Consider using a mild antibacterial detergent. Be sure to remove all hay, dirt, or crime before storing the trailer for the season. To safe use our new horse trailer, we can set up periodic maintenance routines for every 3 months or at least two times in a year. We should make sure to frequently check the brakes, inspect the floor, and oil the hitch ball at each maintenance interval. Also, we should consider taking the trailer to an automotive technician for a yearly checkup. This could actually save money eventually if an automotive technician spots problems early, resulting in a modest repair. We should make sure to wash and wax the horse trailer at least two times in a year, and oil the door hinges at least once per year. Finally, replace the tires every four or five years. Subsequently, switch off all electrical devices to save batteries and protect against fire dangers. Drain water tanks and any hoses. And then, close all doors, windows, curtains and vents to prevent insect damage and potential moisture build-up during the winter season. Finally, keep in mind to check on the stored trailer occasionally to make sure all is well. Doubletake Trailer Sales is a renowned company famous for selling the quality product and services in terms of cargo trailers (let it be the horse trailer, concession trailer, construction trailer, or the motorcycle trailer, all can be attained under one roof). If you are in need of good trailers (that too in an affordable price) then refer to Doubletake trailers without a doubt and you will be amazed with their affordable prices and offers. They provide the best services in the USA (and at the borders of Canada) with their most reliable team. If you are looking to buy the best Enclosed Cargo Trailer, nothing can beat the Freedom trailers. Here are some benefits of buying the freedom’s Enclosed Cargo Trailer from Doubletake (for they are the best cargo dealers of the US). The enclosed cargo trailers are strong at the inner and outer body with great quality metal tubing used at all the frames of the walls and ceilings. This metallic body makes it reliable for all seasons to be used without damaging the inner storage no matter what. The material used is the American made axels by Dexter. Freedom Enclosed Cargo Trailer’s affordable pricing is the main factor which has made it attain a tremendous recognition in the market. The trailers are big spacious and start from a very reasonable price of $2000. You can easily buy it or avail its services according to your need and preference. Freedom Enclosed Cargo Trailers not only differ in pricing from each other but are also versatile in shape and properties. ‘Freedom 8.5×20 Enclosed Trailer Enclosed Trailers’ has 5200 lb tandem axles with Bright Anodized aerodynamic Header Cap, triple tube tongue, square tube construction, 48″ RV style side door, silver wheels, 6’6″ interior height, roof vent, 12v lights, LED tail lights, 3/8 walls and 3/4 floor, and a 6 Year Factory Warranty. While there are other models like ‘6 wide tapered front enclosed trailer’, 8.5 X 24 Plus V-Nose Enclosed Trailers, and Freedom 8.5×24 Car Hauler Enclosed Trailers. Each has a different build and a different purpose of usage. It is very much essential to involve a reliable dealer who can deliver you the product in the most reliable way, such trusty dealers are the ‘Doubletake Trailers’, who provide the best dealing and delivering services. It is not a problem if you are not ready to drive the trailer, Doubletake will deliver the ordered trailer at your doorstep with little charges. Doubltake deals in delivering the right thing with warranty in order to serve the customers well. The enclosed cargo trailer has a warranty of 5 years at-least, making it achieve more hype in the cargo Industry. From the affordable prices to the deliverance of the huge trailers at the door step, Doubletake takes great care of your buying and does not leave you unimpressed from offering such ethical and caring services. One of the most important factors to consider when buying a horse trailer is safety. If your horse trailer is not worthy of the road, you could put both you and your horses in danger, not to mention everyone else on the road. Blown tires have resulted in the death of many horses, so do not cut corners when deciding whether your horse trailer is worthy of the road or not. Horses are prairie creatures that are designed for life in open spaces. Horses are claustrophobic by nature, so more space, light and ventilation in the trailer, less stress on the horse and the facts are that most horses are very sensitive to dust and noxious gases. The horses are large and strong animals and the equipment you carry with them is heavy. Therefore, the design of the trailer must be able to withstand kicking, rough loading and even a fallen horse. When loading the horses make sure that they are driven in the trailer with straight load and tied forward. This is the direction in which you will travel comfortably. Make sure the trailer has proper safety loops, in the form of tie rings, chest bars, rods and dividers, you need to make sure the horse does not attempt to cause damage or escape while on the road. These must be firmly attached to the inside of the trailer, with no sharp edges prominent for the horse to be injured. Lastly, do not forget to think about your own needs when buying a horse trailer. So, for example is the trailer going to be used for long journeys? Do you need it to include a costume for the shows? Do you need a crib to sleep? Is your current vehicle going to be able to easily pull the trailer? Is there room to store your computer too? Cargo trailers are different from horse trailers and so is their uses. Aluminum has become very popular for use in the frame and body of horse trailers in recent years. Aluminum trailers tend to cost more in advance, but generally they maintain their value better over time than steel trailers. The main disadvantage of steel is weight, but since less steel is needed for strength than aluminum, a steel trailer can be compared very favorably to aluminum with respect to weight. The fact is that aluminum must be thicker than steel to be so strong, therefore, an all aluminum trailer is not always lighter than a trailer made of other material. Repairs to aluminum trailers can be more difficult because aluminum welding is more difficult than welding steel. So before selecting an aluminum trailer consider all the disadvantages. Goosenecks are usually larger trailers and can carry more weight. Goosenecks are also easier to maneuver and make backups. Gooseneck trailers offer excellent towing stability and easy maneuverability when towing or parking and come in 6′ or6’ 8 “wide models. Beloved for its stability in the road and soft ride. For more than two horses, a gooseneck is the best choice. Do you need a stronger vehicle? Not all trailers fit with every vehicle, so it is best to check this out beforehand. The owners budget, the use of the trailer, the size of the trailer, the type of trailer and the towing vehicle to be used are all factors that must be addressed, and not particularly in this order. Buying a trailer that has more than two horses requires a sturdy trailer vehicle, so you will spend more money not just for the trailer, but for the truck needed to pull. There are more vehicle options for a tag-along trailer, which means there is also a better chance of choosing the wrong one. If the tow vehicle is properly graded and equipped with the proper hitch, a two-horse trailer with tag along the chain can be as safe as a gooseneck. These are some of the 7 things you need to have in mind while purchasing a new Trailer. You can visit websites like DoubleTakeTrailerSales to see more samples. 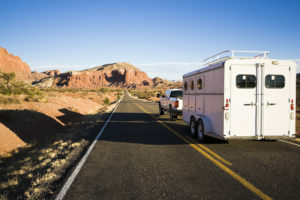 There are three most common trailers you’ll see in town, whether you want a solo horse trailer, or want to up your game by buying a two-horse or three-horse trailer. These trailers are the most common horse trailers you may find in the market. Step-up trailers are ideal for loading the horse but when it comes to unloading it, that’s another story. These trailers can also make the horse vulnerable to slips and it can also leave it panicked if the horse doesn’t find the ground to land easily. To eliminate that risk, it’s ideal to add a ramp to step-up trailers or avoid buying one in the first place. Be sure to buy a ramp that’s long rather than short, and has a non-slippery surface, offers a gradual slope and is assisted by springs. Slant-load trailers are one of the best horse trailers because they provide the horse to go inside and come outside head-on. This is because slant-load trailers have a much wider width than step-up trailers. Most horse trailer dealers like DoubleTake Trailer Sales offer up to 6.8 feet wide trailers and up to 7 feet tall ones too. With so much space inside, the horse also feels a lot easier to rest, turn around and go in and out quickly. If you’re looking to opt in two-horses in one trailer then straight-load trailer might be the ideal buy. These trailers allow the horse to extend their neck as they have a stall length of up to 8 feet. However, you won’t find stall length greater than that as Federal Law limits it to 8 ½ feet, which is why these might not be the trailers you’re looking for. 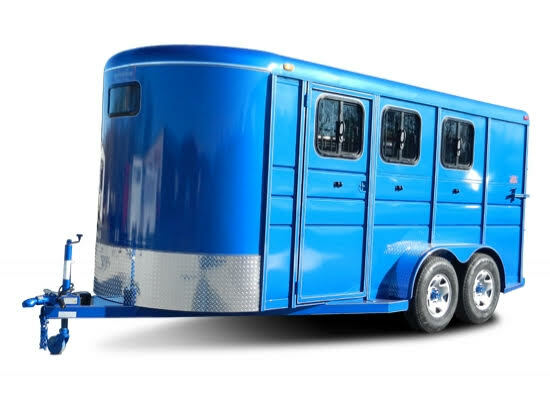 If you’re looking for factory direct horse trailers such as calico ones, you should consult with a dealer that is authorized to sell such brands. DoubleTake Trailer Sales might be a good option if that’s what you’re after. DoubleTake Trailer Sales offer one of the most reliable rates on horse trailers. They also offer electric brakes on both axles (for added safety) and have standard 6.6 feet tall and 6 feet wide horse trailers as well as those that are ideal for drafts or taller horses too. But before buying the right trailer, you should take notice whether you’d need a tack room in your trailer or not. If you do need it, you should know what kind of tack room, either with a solid wall or a swing wall would be a better option for you. We’d recommend choosing the solid wall tack room since it provides better weatherability. However, if you want a versatile tack room, then a swing wall would be a better choice. That’s it! Now you know the very basics of buying the horse trailers. For more information, you can consult with DoubleTake Trailer Sales and you can also get a free quote from them to have a rough idea of how much the trailer would cost you.